December 7, 2012 - Iberia has announced details of its new commercial and routes policies under the Transformation Plan it announced recently. The plan is intended to restore profitability to the airline, which racked up operating losses of 262 million euros in the first nine months of 2012, and thus to ensure its future viability. The plan calls for optimizing the Spanish airline's route network in 2013, strengthening the most strategic and profitable routes, and dropping loss makers. Subsequently, it expects to resume growth if economic and market conditions allow, increasing revenues while cutting sales costs, to build a solid platform for future growth. Iberia plans to improve connections to its busiest long-haul flights, achieve a better balance between business and holiday traffic, and augment its future growth possibilities. Within the Transformation Plan, it will boost services to some long haul destinations such as Brazil, Mexico, Miami, Central America and Chile and Ecuador. It will also increase capacity to some other short and medium-haul destinations, including London, Casablanca, Algiers, Dakar, Nouakchott, and Malabo. The airline will drop some routes now dominated by holiday traffic, where it competes on unfavorable terms with other airlines. These include flights to Athens, Istanbul and Cairo, which will be suspended in mid-January. From 1st April it will also suspend flights to Santo Domingo and Havana. San Juan de Puerto Rico will be offered via Miami and Montevideo via other Iberia destinations in the region. 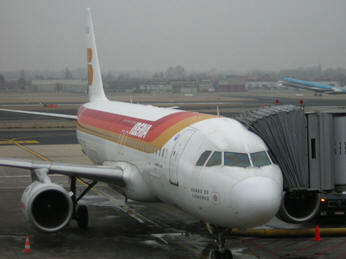 Iberia pledges to be flexible with customers holding reservations or tickets for flights on the routes to be dropped. It will offer full refunds or alternative travel on other carriers – on Vueling to Athens, Egyptair to Cairo, Turkish Airlines to Istanbul, and Air Europa to Santo Domingo and Havana. Following these changes, Iberia group airlines will fly to more than 90 cities in some 40 countries, some of them new territories for Iberia, such as Ghana, Mauritania, Angola, and the city of Oran in Algeria and Los Angeles in California. To generate new revenues and reduce costs, Iberia will offer all-new Economy and Business class sections on its long-haul flights. The new cabin interiors, seats, and entertainment options will be available on the current fleet of Airbus A340-600s, and the A330s to be delivered starting early next year. The company is also working to improve ground services, while seeking additional sources of revenue, such as the new VIP lounges in Miami and Buenos Aires. The new policies are crucial for returning the airline to the black and maintaining its market leadership. The Transformation Plan calls for focusing on strategic and profitable routes, where there is still growth potential. Iberia will improve connections for long-haul flights, offering one or two daily frequencies, with all-new Economy and Business class sections, new seats, customized entertainment, and better services overall. Other new products and services will be launched to build revenues. Next year, and within the Transformation Plan, Iberia will increase its capacity to long haul destination like Brazil, Mexico, Miami, Central America, Chile or Ecuador. It will also increase seat supply to London, Casablanca, Algiers, Dakar, Nouakchott or Malabo. It will drop the mainly holiday travel routes between Madrid and Athens, Cairo, Istanbul, Santo Domingo and Havana; these destinations can be reached directly from Spain by other airlines. San Juan will be offered via Miami, and Montevideo via other Iberia destinations in the region. Customers holding tickets or reservations on the routes to be cancelled will be offered alternative travel arrangements or full refunds. On April 8, 2010, British Airways and Iberia had signed an agreement to merge, making the combined operation the third largest commercial airline in the world by revenue. Shareholders of both carriers approved the deal on November 29, 2010. The newly merged company, known as International Airlines Group IAG, was established in January 2011, although both airlines will continue to operate under their current brands. In November 2012 Iberia had stated it planed to reduce the number of employees by 4,500 and its fleet by five long-haul and 20 short-haul aircraft, in a "fight for survival", as IAG's chief executive officer said.